Radar systems are critical for assisting meteorologists in weather forecasting by detecting changes in local weather patterns and bringing attention to distant weather patterns. CPI has the experience and range of products available to support new and existing weather radar systems. Offering a large range of coaxial magnetrons, klystrons, and receiver protectors, CPI is unique in the capability of delivering individual microwave components or a complete transmitter to meet specific application requirements. Available transmitters are designed to provide a wide range of output power options, custom user interfaces, and remote networking capabilities. 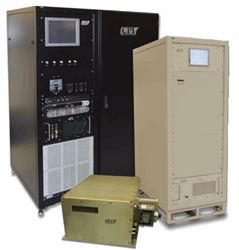 These products also operate over the S-band, C-band, and X-band frequencies. For more information on the many types of weather radar product solutions that CPI has to offer, download the related brochure.